Internationally known for his captivating, three-dimensional visual illusions, Argentine artist Leandro Erlich assigned ShowTex to install a series of large lightweight mirrors for his latest installation in Dalston, a new commission by the Barbican Art Gallery, part of ‘Beyond Barbican’. Resembling a theatre set, the detailed facade of a Victorian terraced house – recalling those that once stood on the street – lies horizontally on the ground with ShowTex Giant Mirrors positioned overhead. The visitors’ reflections create the impression of standing, hanging, or walking on the wall. 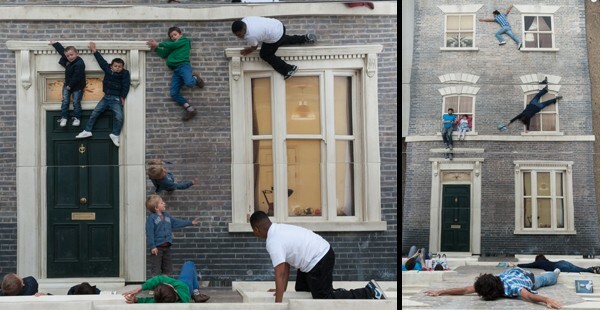 Dalston House is part of the 2013 London Festival of Architecture and is installed on a disused lot on 1-7 Ashwin Street that has remained largely vacant since being bombed in the Second World War. It is also part of Beyond Barbican - an exciting program of events taking place outside the walls of the famous arts centre that includes pop-ups, commissions and collaborations across east London. Erlich explains: "The installation of the enormous mirror hanging at an overhead 45 degree angle was definitely a huge undertaking, however, I am very pleased and impressed with ShowTex’s work on site and the final result!" The exhibit runs until 4 August.